Can you match the following? 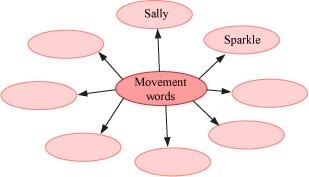 A word or a combination of words, whose sounds seems to resemble the sound it denotes (for example: "hiss", "buzz", etc.) is called onomatopoeia. From the words that you have filled in the blurbs above, point out these words. The following is a flow chart showing the course of the brook. Can you fill in the blank spaces with help from the phrases given below? The message of the poem is that the life of a brook is ___________. The poet draws a parallelism between the journey of the brook with ___________. The poem is narrated in the first person by the brook. This figure of speech is ________. And here and there a grayling"
How does the brook 'sparkle'? 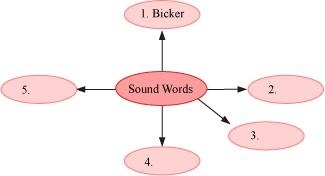 'Bicker' means 'to quarrel'. Why does the poet use this word here? How many hills and bridges does it pass during is journey? Where does it finally meet the river? Why has the word 'chatter' been repeated in the poem? With many a curve my banks I fret'- What does the poet mean by this statement? 'I wind about, and in and out.' What kind of a picture does this line create in your mind? Name the different things that can be found floating in the brook. 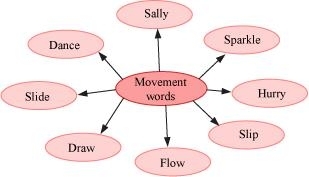 What does the poet want to convey by using the words 'steal' and 'slide'? The poem has many examples of alliteration. List five examples. 'I make the netted sunbeam dance.' What does 'the netted sunbeam' mean? How does it dance? What is the 'refrain' in the poem? What effect does it create? Who does 'I' refer to in the given lines? Why has the poet used the word 'brimming'? What kind of a picture does it create? Explain the last two lines of the stanza. Identity the rhyme scheme of the poem. The poem is full of images that come alive through skilful use of words. List out any two images that appeal to you the most, quoting the lines from the poem. The brook appears to be a symbol for life. Pick out examples of parallelism between life and the brook. Literature Reader - English : CBSE NCERT Exercise Solutions & Summary for Class 9th for The Brook will be available online in PDF book form soon. The solutions are absolutely Free. Soon you will be able to download the solutions.